The notion that Iran supplies arms to Hamas is something that has become conventional wisdom in the mainstream media. I’ve been agnostic on this issue myself, although the logistical challenges of a direct Mediterranean route, given the presence of Israeli patrol boats that have besieged the territory in the last few years, have always seemed a bit daunting to me. Still, it always seemed possible that weapons originating in Iran could be smuggled into Egypt — either via Mediterranean routes or into Sudan, especially by air, and smuggled into Egypt — and then across the Sinai and through the tunnels. 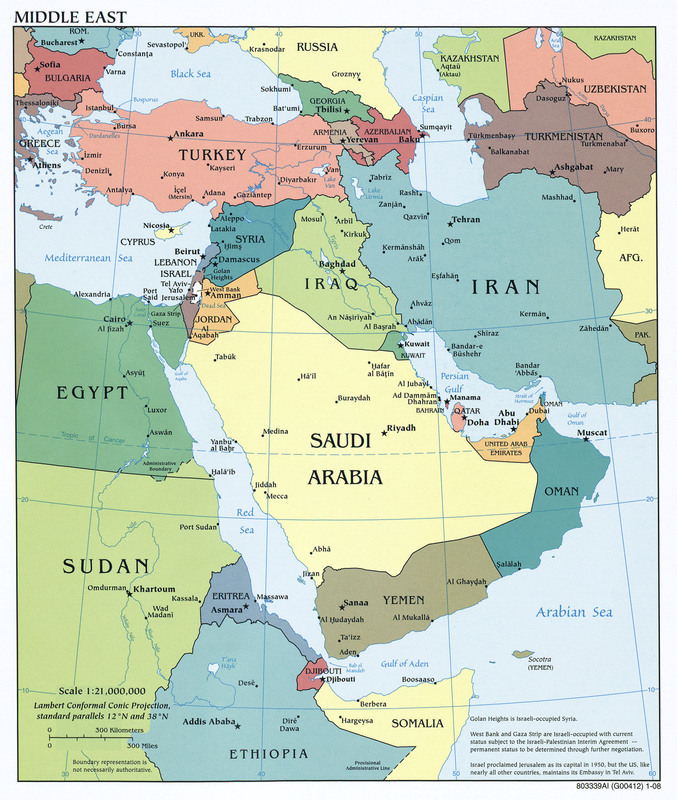 So I was shocked Wednesday to hear Elliott Abrams tell reporters during a teleconference hosted by his new boss, the Council on Foreign Relations, that one route used by Iran was by ship “around the Gulf of Aden,” but not “through the Canal.” Rather, he said, “it seems that they [the shipments] hit land in places like Yemen or Somalia or, I guess, Eritrea, to some extent and then cross over into Sinai” and then into Gaza. The questioner had explicitly mentioned the widely cited Sudan route, but he didn’t mention Sudan in his answer. Now, I didn’t tape the exchange and thus I can’t say that the above quotes are precisely accurate. CFR hasn’t yet posted a transcript, but I have no doubt that the key entrepots cited by Abrams were Yemen, Somalia, and Eritrea. But is this route credible? First, there are lots of pirates in the Gulf of Aden who would love to get their hands on such cargo for all kinds of reasons, and, second, because there are so many pirates, the area must now be one of the most heavily patrolled in the world. But, putting that aside, shipments landing in Somalia would have to be smuggled through Djibouti (where the U.S. has a major military presence) or Ethiopia, whose border with Eritrea is heavily militarized, as both countries have still not settled the border over which they fought a very bloody war ten years ago. And, even if weapons were successfully smuggled across that border (or the Red Sea from Yemen), they would still have to traverse hundreds of miles in Sudan and Egypt before getting to the Sinai. I have to say that Abrams’ answer made me much more skeptical about the amount and significance of weaponry allegedly being supplied by Iran to Hamas. a small insight into the minds of those who are traders, but eschew the customs booth. person who pretends to look for prohibited items or just waves the trucks on………..
in less free countries where an unhealthy curiosity can get you disappeared………. where citizens seeing big government planes, trucks doing sketchy stuff, stay AWAY..
I’m sure with the right papers one could get ten trucks of anything across Saudi Arabia.. It is claimed by the agitpropers that Hamas is a satellite organization of Iran. If that is so, then Iran has done a poor job of supplying their Palestinian subsidiary. Where are the Iranian product improved and manufactured weapons that Hizbullah possessed in numbers in ’06? Where are they? Impossible to deliver? All of them? It would seem that political support and encouragement is one thing. Supply is another. There is simply no evidence that Iran is supporting Hamas AT ALL. Yes, some verbal support, maybe some money – but where are the supposed weapons? There is no evidence of sophisticated RPGs or MANPADs being used in Gaza. Weapons Iran produces for itself. The “smuggling throug Africa” nonsense comes from the Institute for National Security Studies in Tel Aviv and the Jerusalem Post based on zero facts. Abrams is just talking that up. Indeed people on the ground in Sinai do believe the weapons transfer are coming through the Sudan route. It is possible that their origin in Africa is Eritrea, or even that the weapons do not originate from Iran at all but are bought from the surplus of the continent’s many wars. Because in the end, remember, most of this traffic is probably small arms. The rockets Hamas launched at southern Israel are not sophisticated weapons, and indeed through the recent war Hamas only killed 10 soldiers and showed no anti-tank or anti-helicopter weapons to speak of. If the Iranians are directly supplying weapons, unlike with Hizbullah they are not supplying game-changers. Brings back old memories doesn’t it? Remember the Iraqi WMDs and Iraq’s link with the Al-Qaeda? Donald Rumsfeld saying that “we” know exactly where the WMDs are hidden (or something to that effect)? It is those people who supplied the “intelligence” on Iraq and Saddam’s dastardly plot to bring the world to an end, are no doubt supplying information on Iran’s atom bomb and support for Hamas and Hezbollah. These people may have pushed the US towards bankruptcy but that is a small price to pay to make the world safe for Israel. Wake up America! What is it with you people? Why do you give oxygen thieves like Abrams the time of day?